It’s man versus nature in the latest offering of the Deer Hunter series. You will take yet another foray into the wild lands, using your sharpened senses and keen human intellect to outwit some of the most beautiful and dangerous animals on this green earth. You will arm yourself with only the best hunting weapons money can buy, roam the countryside, and see if you can bring home at least one fine trophy to mount onto your wall. You have to be smart though; you need to stay hidden, you need to avoid spooking your quarry, you need to have good aim, and you need to have fast reflexes. Most of all, you need to be careful, lest you stop being the hunter and become the hunted. 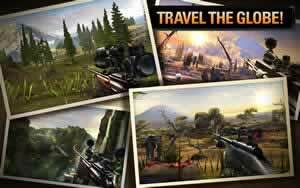 Deer Hunter 2014 is the best way to learn how it feels to look down the scope of a hunting rifle from the comfort of your mobile device. The game will insert you into a variety of scenic locations, from the Appalachian forests to the African Serengeti, and task you with hunting game in a variety of ways. You have the tools you need to bring down the wiliest animals out there; it’s up to you to bring the skill. Aim carefully. It’s not enough to simply hit the animal; they might still get away. If you really want to walk home with a new trophy, aim for the heart for best results. Animals react to environmental stimuli. Timid creatures will panic and run while spooked, while some especially aggressive predators may attack you. Hunt down deer, wolves, lions, zebras, buffalo, elephants and more. Enhance your sight with an assortment of visual modes, including infrared and x-ray vision. 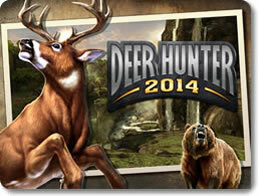 Hunting in Deer Hunter 2014 can be both expensive and profitable. As you bring down game animals and complete challenges, you’ll earn money which can be spent to unlock all sorts of goodies. 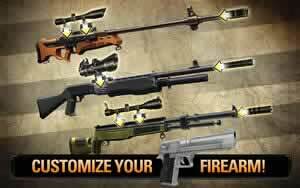 Purchase a variety of new weapons, from hunting rifles to shotguns. Upgrade your weapons. Improve their barrels, stocks, muzzles, sights and so on to make them more lethal against bigger prey. Unlock new levels that feature more exotic animals and hunts to complete. The Deer Hunter series has always been the go-to franchise for when you want to legally hunt out of season without a permit. This latest entry takes everything great about the previous games and builds upon them in the most exciting ways to give you an in-depth portable hunting simulator. Travel all over the world, encounter fascinating animals, and kill them to prove that you are the single greatest hunter on the globe.